The Guardian reported (4TH April, 2014) that Japan’s biggest online retailer, Rakuten, will stop their whale meat and dolphin meat sales by the end of April after the International Court of Justice ordered Japan to immediately halt its annual whale hunts in the southern ocean. Rakuten said it had asked sellers to cancel sales of whale meat products on its website “in accordance” with the ICJ ruling. Monday’s verdict in the Hague. It should be pointed out that it did not cover whale meat sales within Japan, which are legal, or the country’s slaughter of whales in the north-west Pacific and in its own coastal waters. The decision by Rakuten comes soon after the UK-based Environmental Investigation Agency (EIA) exposed the company as the world’s biggest online retailer of whale products and elephant ivory. Now I can’t recall that Japan ever had permits to study the biology of elephants by turning them into carved ornaments and chess pieces. The prohibition of ivory hunting in Africa and even the shooting of poachers haven’t stopped the practice if Rakuten’s sales are an indicator. Banning a desirable commodity raises its price and drives it into the black market; look at drugs and guns for example. Until recently Rakuten’s website carried more than 28,000 advertisements for elephant ivory and 1,200 for whale products, according to the EIA and the Humane Society International. So what does this have to do with sharks? Justin McCurry writing for the Diplomat (11 Feb, 2011) had visited the fishing docks of Kesennuma City, Japan in an undercover operation. 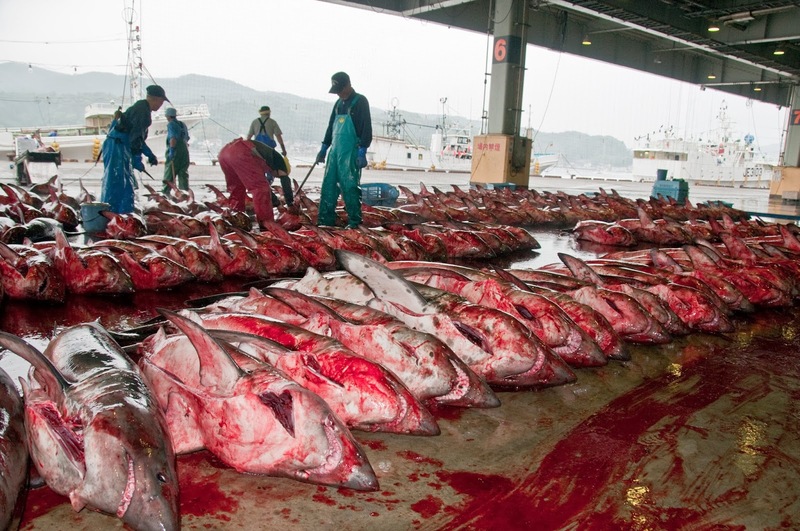 Kesennuma netted some 14,000 tons of sharks in 2009, for which the Japanese operation earned more than 2.4 billion yen. 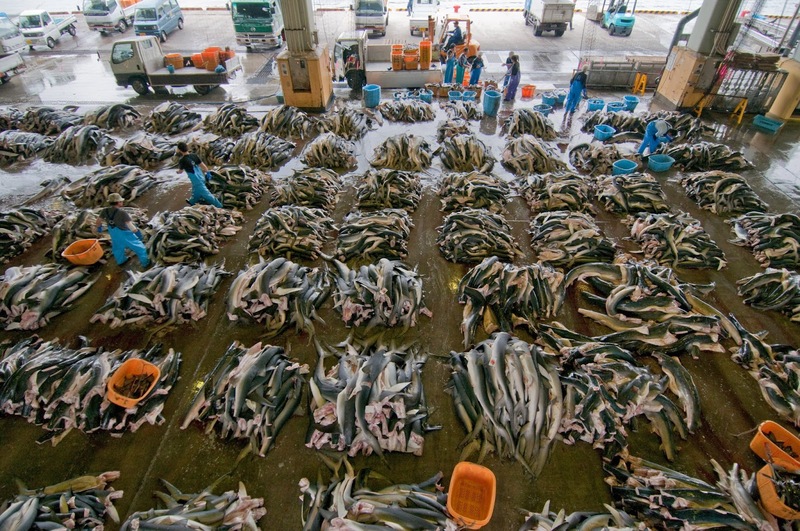 Asian shark markets like these turn over thousands of tons each year. But it’s important to understand that fishing for sharks isn’t just a problem created by the Japanese. It’s true that they are successfully capitalizing on the trade of threatened species but as far as sharks go, they aren’t doing the killing. On March 1, 2013, “Global Catches, Exploitation Rates and Rebuilding Options for Sharks,” was published by Dr. Worm and three other researchers from Dalhousie University teamed up with scientists from the University of Windsor in Canada, as well as Stony Brook University in New York, Florida International University (FIU) in Miami and the University of Miami. A very powerful team indeed. 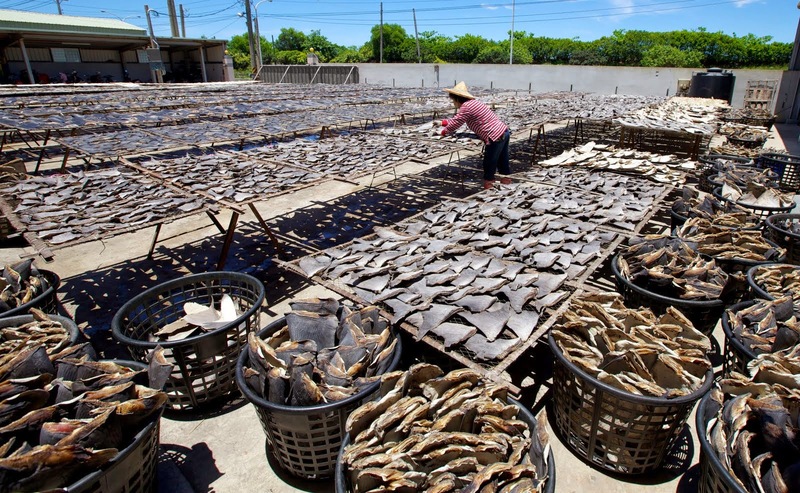 Shark fins are usually dried in the sun allowing the activity to go on as small scale operations. 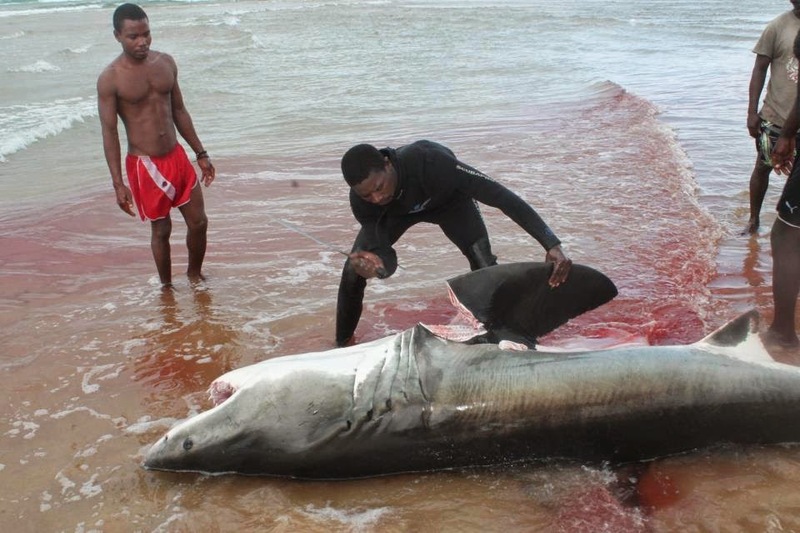 Their shocking findings are that fishing for sharks is now globally unsustainable. Their more recent estimates put the carnage at 97 million in 2010. The possible range of mortality is between 63 and 273 million annually. This equates to somewhere between 7,200 and 31,000 sharks per hour. Because shark fins are so valuable and boats are limited in the amount of cargo they can carry, most shark finning is done at sea. 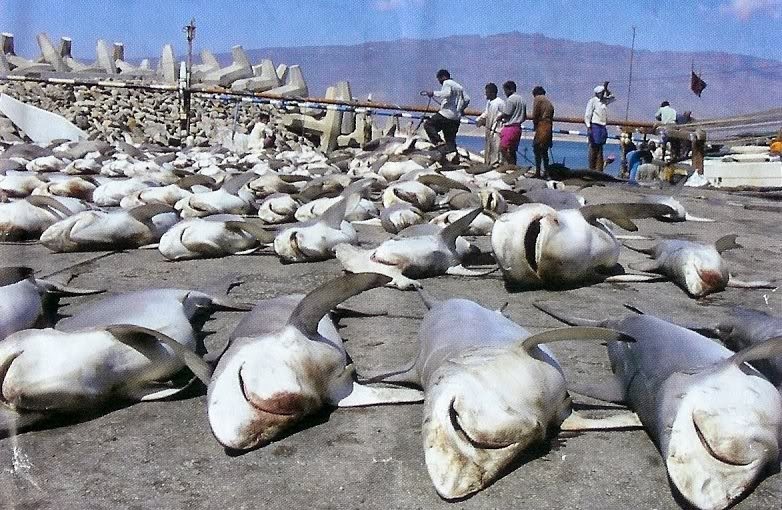 The low value shark carcasses are dumped at sea and only the high priced fins return to market. Most shark finning is done in under-developed countries but the fishermen benefit little from the high prices the product fetches at the retailers. 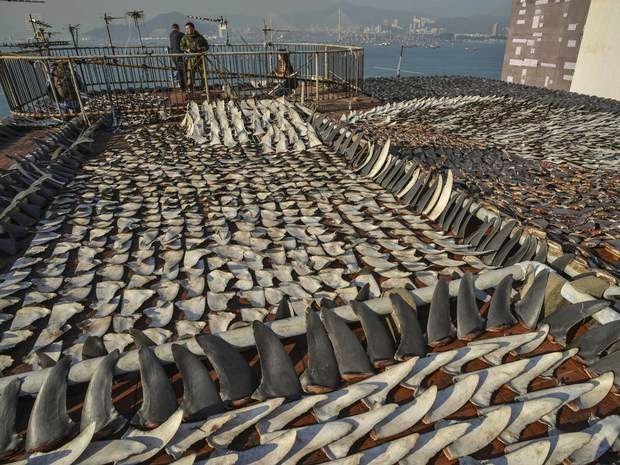 Save our Seas Foundation provide shark fin statistics up to 2006. So, who is buying them? “Malaysia also caught 231,212tonnes of sharks from 2002 to 2011,” which is the eighth highest globally, accounting for 2.9% of the total global reported shark catch during that period. Victoria Mundy-Taylor and Vicki Crook were quick to point out that as a signatory to the CITES (Convention on International Trade in Endangered Species of Wild Fauna and Flora), Malaysia has an international obligation to implement measures intended to ensure the international trade in products of the shark species protected under the Convention is both legal and sustainable. As far as I know, there is no ban on shark and manta ray trading in Malaysia. 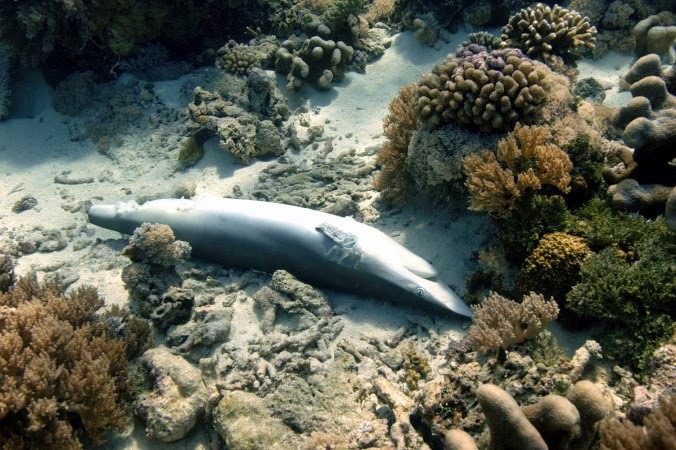 The eastern Malaysian state of Sabah is said to be considering bans on shark fishing and finning but has held back wanting similar provisions to be included in the federal Fisheries Act 1985. There does not seem to have been any action yet. Even though shark fishing for most species is now clearly unsustainable, it’s difficult to put an end to traditions and business success in this rapidly growing Asian economy. The next vexing question is how the shark traders of developing countries would react to bans that halt their income in these super-competitive economies. 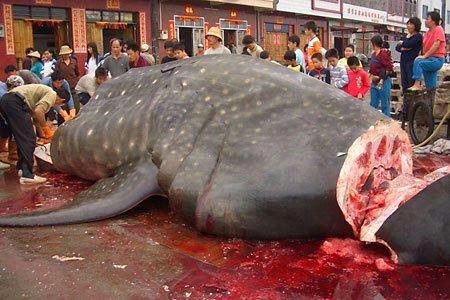 This harmless whale shark is the world's largest fish species and now faces extinction. How willing will a trader be to give up his income and improving standard of living because the “western” world tells him to? I think the answer is he won’t change and corruption will ensure that there is business as usual. I don’t want to rain on the conservationist’s parade, but banning shark fins in Asia will probably drive the business underground. Roof top drying of illicit shark fins. According to Mr. T. Packard of the conservation group, PangeaSeed, shark fins are the third most valuable illicit product in the world today. Drugs and guns are first and ivory is fourth in terms of cash generated. Shark conservation must go ahead if we want to stop the ocean’s ecosystem from passing through a tipping point that may catapult us into a disastrous world fisheries situation. But we will never achieve this with an iron fist. Conservation groups and governments must provide alternative business enterprises if they are not to drive the shark fin trade deep into the black market. Within 30 years shark fin soup will no longer symbolize prosperity. Instead it will be a tribute to man’s greed and lack of commitment to his own future. I wish to thank Shawn Heinrichs and Nancy Boucha for the excellent photographic work.